Jordan Ingram reporting for FishDuck.com at the NCAA Eugene Softball Regionals at Howe Field in Eugene, Ore.
On the second day of the NCAA Eugene Regionals, No. 25 North Dakota State wanted to make a statement against the No. 1 Oregon Ducks. But the three-time reigning Pac-12 Champions showed resolve, battling to a 4-3 victory over the Bison. Janie Takeda broke another school record for most career doubles. The Ducks (48-6) have an opportunity to advance to the Super Regionals with a win at 1:00 PM over North Dakota State, or in the rubber match at 4:00 PM if necessary (Live stream at GoDucks.com). The Bison sent a message to Oregon junior pitcher Cheridan Hawkins (29-3) in the first inning with a solo home run from Cheyenne Garcia, giving the Summit League champs an early 1-0 lead. Hawkins allowed a total of three runs – more than any of her six career NCAA Regional performances combined. 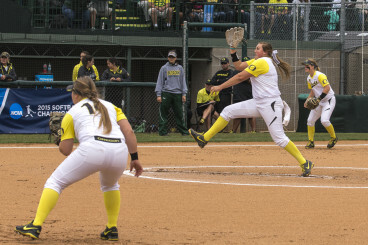 Hawkins threw 11 strikeouts and allowed three runs in Oregon’s 4-3 victory over NDSU. NDSU’s pitcher Krista Menke (32-4) was as good as advertised and a solid defensive effort allowed only one Duck on base through three innings. 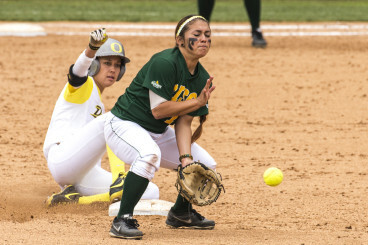 In the bottom of the fourth, Oregon senior Janie Takeda responded with her 41st career double which became the preamble to the Ducks rapid-fire, four run rebuttal. Freshman Jenna Lilley’s RBI single sent Takeda home for a run and Lilley scored on Hailey Decker‘s RBI double down the leftfield line. Geri Ann Glasco singled with a bunt to third base, advancing Decker to third. 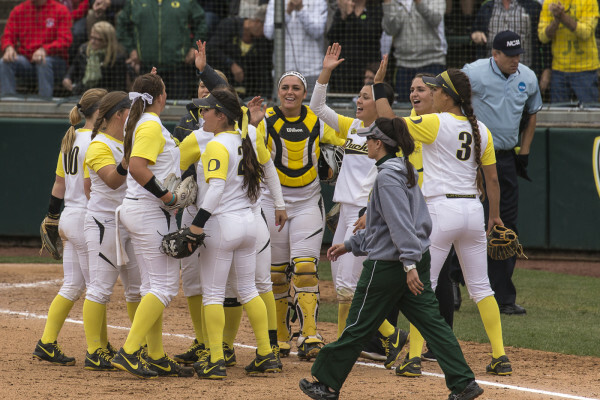 After Decker scored on a wild pitch, the Ducks went up 2-1 for their first lead of the game. 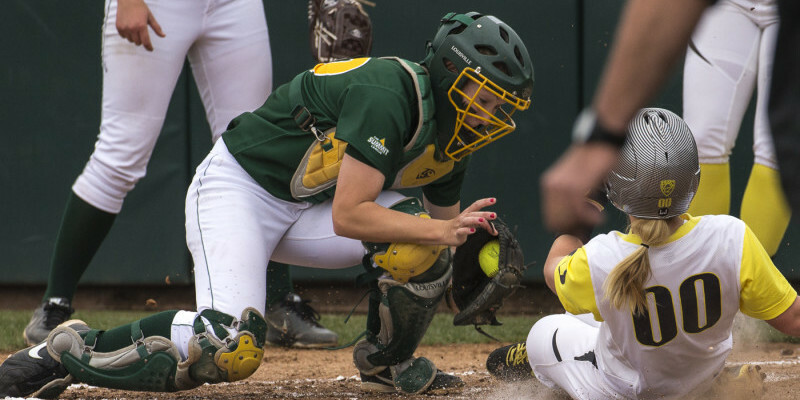 Koral Costa added to the Bison’s woes with a two-run homer and with a 4-1 lead, it appeared Oregon’s offense had provided just enough for the victory. However, a two-run homer by NDSU’s Logan Moreland in the top of the sixth erased Oregon’s three run cushion, pushing the Bison to within one. But the Ducks didn’t relinquish their lead, holding on to finish the game, 4-3. The afternoon also marked another collegiate milestone for Takeda with her second double of the game – her 42nd-career double and another career school record this season. The Ducks play North Dakota State Saturday at 1 PM at Howe Field. Oregon clinches a Super Regional berth with a victory over the Bison in the four-team double elimination tourney. The Bison, already down a game, would need to beat the Ducks in the 1 PM game and then again in a 4 PM rubber match to advance. The Ducks are a victory away from a Super regional appearance.